Christina Shea was first elected to the Irvine City Council in 1992 in a landslide victory. She is passionate about serving her community and was elected Irvine Mayor in 1996 and re-elected in 1998. In 2002, Christina returned to the Irvine City Council and served as a Councilmember until 2010. In 2012, she was once again elected to the City Council where she continues to serve. In 2017, and then again in 2019, she was chosen to be the City’s Mayor Pro Tem. With the election of Mayor Don Wagner to an Orange County Supervisor seat, Christina became Mayor on April 3rd, 2019. In addition to her Council duties, she is member of the Transportation Corridor Agencies, serving as Chair of the Foothill/Eastern Transportation Agency, a member of the Southern California Association of Governments (SCAG) Regional Council, a Board Member of the Orange County Sanitation District, and a Director of the Orange County Great Park Board of Directors. 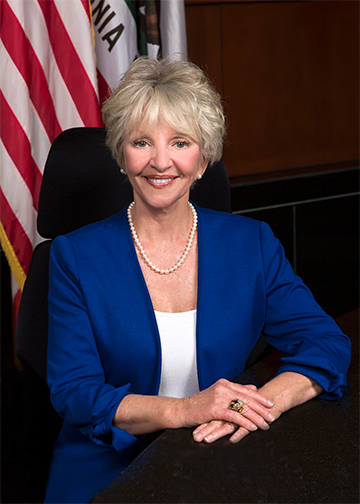 In the past, she has served as Chair of the Task Force to Review Housing Needs of the Developmentally Disabled, Chairwoman of the Ad Hoc Veterans Affordable Housing Committee, as a member of the Ad Hoc Great Park Forensic Audit Committee, on the Board of the El Toro Reuse Planning Authority, a member of the Irvine Unified School District (IUSD) Liaison Committee, and as a Director of the Irvine Community Land Trust. She has been named one of Orange County’s “Leaders of the Year” by the California Women’s Leadership Association and featured as one of the “Most Influential Women in Orange County” by the Orange County Metro Magazine. In 2008, she was recognized by Assemblyman Chuck DeVore to be the Woman of the Year for the 70th Assembly District. Mayor Shea brought forward a proposal to make Irvine one of the first cities in the U.S. to use only organic pest abatement practices in the City’s parks, green belts, and open space. This approach to pest abatement has since been adopted by over 160 communities across the country. In addition, Ms. Shea champions the development of an Orange County Veterans Cemetery at the former MCAS El Toro military base. She has always been a strong supporter of local law enforcement and has seen the City of Irvine reap the rewards, being named as America’s Safest City for 13 consecutive years among cities its size. Dedicated to sound fiscal responsibility for both the present and the future, Christina supports privatization and opposes municipal tax increases. During her years on the City Council, she helped streamline Irvine’s municipal services, saving taxpayer dollars and creating greater efficiencies. Additionally, Mayor Shea has served with numerous volunteer organizations, including the Board of Directors of the American Cancer Society, the Board of Directors for the Irvine Child Care Project, and on the Advisory Board and past Capital Campaign Director for Human Options. Ms. Shea has been a resident of Irvine since 1977 and currently lives in Quail Hill. Apart from her many civic duties, she is an independent business consultant and realtor.